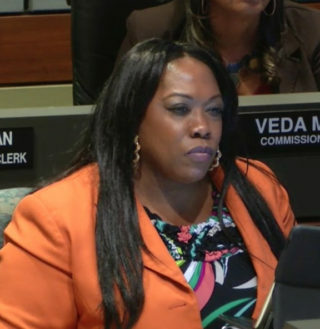 The Sarasota city commissioners voted unanimously this week to accept the evaluations each had completed of the city’s three charter officials. However, they split 3-2 on directing staff to research the potential of hiring a consultant to assist them with the process in the future. Commissioner Willie Shaw made the motion regarding the consultant, which Vice Mayor Liz Alpert seconded. Mayor Shelli Freeland Eddie and Commissioner Hagen Brody opposed it, while Commissioner Jen Ahearn-Koch voted with Shaw and Alpert. The mayor and Brody both voiced opposition to the potential expense. Nonetheless, Freeland Eddie concurred with Ahearn-Koch’s suggestion that the form the commissioners have been using for the evaluations should be revised. They “could really be updated and made a lot more efficient,” Ahearn-Koch pointed out. Because City Manager Tom Barwin and City Auditor and Clerk Pamela Nadalini received satisfactory evaluations, they qualify for 3% raises, Jan Thornburg, senior communications manager, wrote in a March 19 email in response to questions from The Sarasota News Leader. Barwin’s salary is $208,023, Thornburg added, while Nadalini is paid $176,207 a year. The raise, Thornburg noted, is similar to the one provided to other city employees who are not represented by collective bargaining organizations. City Attorney Robert Fournier also received a satisfactory evaluation, but he is not a city employee, Thornburg explained. 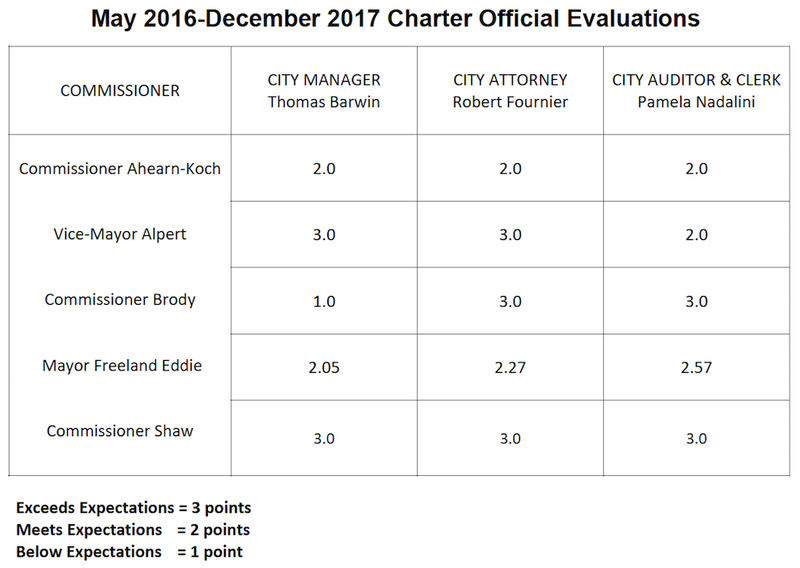 The lowest mark any one of the three charter officials received was the “1” Brody gave City Manager Tom Barwin, whom Brody often has criticized for a variety of reasons since Brody won election to the board in May 2017. Most recently, Brody blamed Barwin for Mote Marine’s decision to work with Sarasota County staff on an effort to build a new aquarium on county land near Nathan Benderson Park. “I think that you need to be more focused on building and strengthening our relationships with community assets,” Brody told Barwin on March 19. Brody conceded that his disagreements with Barwin are rooted partly in ideological differences. However, Brody added that he feels Barwin routinely provides information to the commissioners that plays up the view Barwin holds on the specific issue and downplays or omits material with a different stance. Nonetheless, Brody commended Barwin for making “good hires” and applauded his actions during the community response to Hurricane Irma last year. Shaw gave the highest marks to the charter officials, awarding each a 3, while Ahearn-Koch gave the lowest marks across the board, awarding Barwin, Nadalini and Fournier all a 2. “Yes,” Mason replied, indicating the time frame was at least three years. 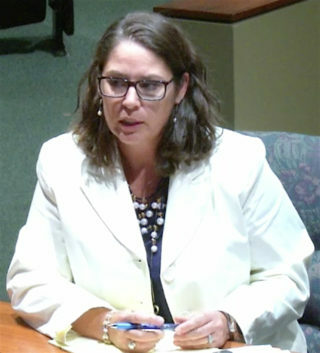 She arranged for a potential consultant to address the County Commission several years ago, she continued, but the board ultimately decided not to engage his services. Shaw then said he would like to direct staff to look into the possibility of hiring a consultant for the next set of annual evaluations. “What would a consultant do?” Freeland Eddie asked. 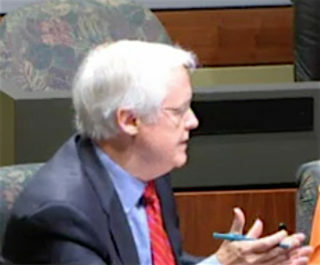 The person would “be a mediator” and also work one-on-one with each commissioner, Mason responded, to ascertain the goals the board members wanted to see each charter official achieve. The efforts to meet those goals, she indicated, would be used in the commissioners’ ratings of the performance of each charter official during the next round of evaluations. “I just don’t see how it’s any stronger than our strategic plan. That’s the document that we use” to grade the city manager, Freeland Eddie added. To hire a consultant “to essentially send messages between us and the city manager,” Freeland Eddie said, did not seem warranted, especially when each commissioner typically meets individually each week with City Manager Barwin. Ahearn-Koch then asked whether the consultant would work with the commissioners in their evaluations of all three charter officials. That would be up to the board, Mason indicated. When Ahearn-Koch asked Shaw whether his motion included all the charter officials, he told her it did. “People hate us spending money on these consultants that just really prevent us from addressing the issues and moving on,” Brody pointed out. Then City Attorney Fournier noted that when the prospect of bringing in a consultant was discussed several years ago, some concerns arose about the potential for state Sunshine Law violations. He would like to research that issue again, he said, if the commissioners were interested in hiring a consultant. After Shaw called for the vote, and the motion passed 3-2, Shaw asked that Fournier undertake the necessary research. That would guide the commissioners in how to proceed, Shaw said. The evaluations were listed among routine business items on the board’s March 19 agenda, but Shaw had pulled the item to discuss the consultant, and Brody had pulled it, he said, because he felt the public deserved an in-depth public discussion of the performance of the charter officials. Then Brody proceeded to discuss his ratings. He did ask that Nadalini address means of sending out city notices in languages other than English, and he suggested she work harder to ensure announcements about advisory board vacancies are disseminated more widely. Then he referenced “negative reviews” that Nadalini received through an anonymous process that Brody himself had proposed for inclusion in the evaluations this year. His goal, Brody explained on March 19, was to encourage employees who report to the specific charter officials to be able to comment on those officials’ conduct of city business. Perhaps, then, hiring a consultant to help with the evaluations “is a productive step in that direction,” Ahearn-Koch said. “That’s what I think, too,” Alpert replied. After Brody concluded his remarks about Barwin, Ahearn-Koch and Freeland-Eddie both talked of having provided their comments to the charter officials in their individual meetings.